Matching navy suspenders and navy satin bow tie. Buy as a set and save. 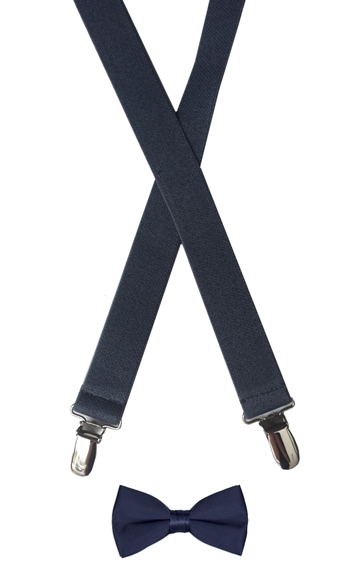 Quality elastic and sturdy polished finger clips on the ends of the suspenders. The suspenders are made in the US. The small elastic suspenders are adjustable to a maximum length of 25 inches and the medium size adjusts to 30 inches. The elastic is 1 inch wide. For the matching banded bow ties, the band is adjustable and can be made to be as short as 10.5", or as long as 17.5", and has a small hook on it that allows the bow tie to be hooked onto a small fastener on the back of the knot of the bow tie itself - the adjustable band allows it to fit on most kids between the ages of 1 and 8.